Delhi girl, Shubreet, has a one-year-old brand called Gingerline that’s all about geek-chic decor. She creates stunning statement pieces by offering to turn your favourite hardbound into a lamp, and uses laboratory test tubes to mix roses and lilies. In fact, we’re getting so many gifting ideas looking at these that we’re ready to say it out loud: Gingerline is going to be our go-to for customised home goodies. Shubreet tells us that she’d been designing lamps for her friends before she decided to pursue it professionally. What started as a way to extend the shelf life of her most cherished reads, blossomed into a full-grown baby. With everything she creates, the founder believes in overthrowing conventions and finding beauty in unexpected quarters. 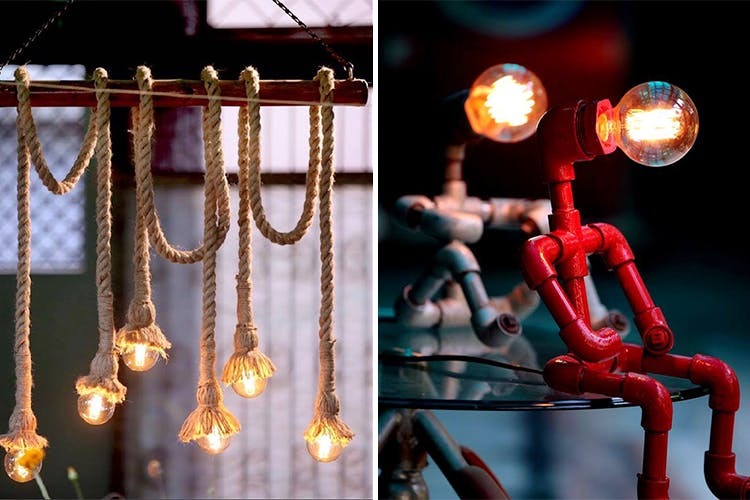 Who’d have thought that a safety pin could turn into a giant towel hanger, or a pencil into a life-size lamp with a glowing eraser and doodle-shaped wire if not for her? All the orders are dispatched directly from the workshop, and anywhere in the country. You can check out the collection and get in touch on Instagram/Facebook and she’d be happy to share prices and timelines. In general, the products start at INR 900 and take about a week to arrive. As of now, there's no official website or a walk-in store, but we're hoping that would turn around soon. Have a bizarre idea of your own? Hit her with it. She loves co-creating products as long as they are doable.